Mick The Miller was born on the 29th of June 1926 in the coach-house of Millbrook House in Killeigh village in Co Offaly, Rep of Ireland. He was bred by Fr Martin Brophy the parish curate who lived at Millbrook. Fr Brophy mated Glorious Event (Sire) with Na Boc Lei (Dam). Glorious Event was owned by Mr PJ Meehan, a solicitor from nearby Portlaoise in Co Laoise. Na Boc Lei was owned by Fr Brophy himself. The result was a litter of 10 pups and Mick The Miller was the smallest and weakest of the 10. Na Boc Lei`s litter with Mick The Miller on Michael Greene`s (in centre) knees on steps of Millbrook House Also in picture are local men Leonard Mathews (on left) and Michael Flanagan (on right). At that time Fr Brophy had Tullamore native Michael Greene working for him. Michael actually lived at Millbrook House too and it was he who oversaw the birth of Mick The Miller and his siblings. As the litter was so large most of them were `farmed`out to local people to rear them. Although Mick The Miller was a weak looking pup, Michael Greene insisted that Fr Brophy keep him and allow him to rear him. They also held on to Macoma. Michael Greene lavished attention on Mick, feeding him milk from a bottle and sometimes bringing him to bed with him. It was he who walked Mick and Macoma for miles around Killeigh to build up their muscles and stamina. He also trained the pair in the paddock behind Millbrook House and later on in the surrounding fields. The idea was to get them ready for coursing, first in local events at Portlaoise and Kilbeggan and hopefully for bigger events like The Waterloo Cup. Fr Brophy`s dogs were also given out to local families in the parish to look after them for periods of time. In the same way that local people would cut peat or do odd jobs for the priest, they would also keep a dog or two feeding and housing him/her for a while. Mick The Miller would have stayed at Morris`s at Mohia Lane in Killurin and Rody Berry`s in Killeenmore. Of course being a small village many other local people would have been involved in rearing Mick and many of Fr Brophy`s other dogs. Some local children with Fr Brophy, his dogs and Michael Greene at Millbrook. By April 1927 track racing had begun in Ireland. The first track built was Celtic Park in Belfast, followed by Shelbourne Park in Dublin, with Harold`s Cross in Dublin soon to follow. Fr Brophy could see the possibility of success for both Mick The Miller and Macoma in this new form of racing. He decided to enlist the services of Mick Horan from Trim in Co Meath who was a licensed trainer at the new Shelboure Park. Mick trained the brothers at Shelbourne Park. Mick The Miller won his first race in Shelbourne Park, the Shelbourne Sweepstakes and a prize of £10. He also ventured up to Celtic Park in Belfast where he won his first round leg and his semi-final but finished third in the final of The Abercorn Cup. His brother Macoma broke his hock in a freak accident in the traps at Celtic Park. It was soon after that Abercorn Cup Final in May 1928 that Mick suddenly became very ill. While this illness was diagnosed as distemper it`s not really known what he suffered from. Whatever it was, Mick received attention from vets including Arthur Callanan and of course his minder Michael Greene. He was ordered to rest and recuperate slowly. So he did no racing or coursing for five about months. In August that year Fr Brophy put the weak Mick and injured Macoma up for sale at an auction in Shelbourne Park. The brothers were seperated when William Washbourne from Wolverhampton bought Macoma. Interestingly Macoma went on to become a successful hurdler. By November 1928 Mick was eventually well enough to compete in local coursing meets. In March 1929 Mick resumed his track-racing career by competing in and winning the Shelbourne Stakes at Shelbourne Park. During the rest of the year Mick went on to win the Leinster Plate and The Spring Cup at Harold`s Cross and The National Cup at Shelbourne Park. After the National Cup Final was the last time Michael Greene his beloved pup. Mick had by now clocked up 15 wins out of 20 races and it was decided to have a crack at The English Greyhound Derby. Mick Horan and Mick The Miller left Ireland 2 days after the National Cup success. At the Greyhound Derby track at White City in London, Mick took part in a trial run, a solo run of 525 yards against the clock. He actually broke the track record by 0.03 seconds! Four days later Round 1 of The Derby took place. This time Mick broke the world record in a time of 29.80 seconds! This meant he was the first greyhound in history to run 525 yards in under 30 seconds! Following that fantastic Derby debut, several offers were made to Fr Brophy to buy Mick. He agreed to sell him to Albert Williams (a bookmaker from Wimbledon) on condition that Fr Brophy would get the prize-money if Mick came 1st, 2nd or 3rd in the final. Mick did indeed go on to win the final and Fr Brophy was presented with the winning cheque of £700. It was also agreed that Fr Brophy would be presented with the trophy. December 1929 to Arundel Hugh Kempton for £2,000 as a present for his wife Phyllis. Mick`s first race under the Kempton`s ownership was the New Year`s Day 1930 Champion Stakes Final, in which he came second. That year Mick went on to win The Wembley Spring Cup, The Loafer Trophy, The Farndon Cup, The English Greyhound Derby, The Cesarewitch, and The Welsh Derby. 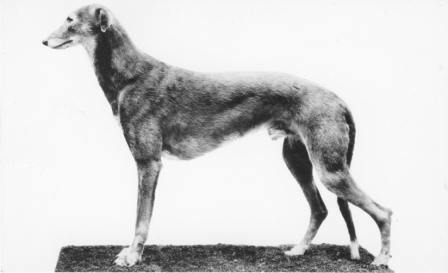 In 1931 Mick reached the English Greyhound Derby Final for the 3rd time in a row. He once again won the final but it was re-run because of a `bump` on one of the bends. He was defeated in this re-run. Later on that year he did win The Wembley Spring Cup, The GRA Sweepstakes No 3 and The Greyhound St Leger. The St Leger win was regarded as his greatest triumph and was his last race before retirement to stud. He spent the next 8 years at stud, with Jack Masters at Mill Farm, near Dereham in Norfolk. He also spent much time attending social events, often appearing as guest of honour at big races including the ones he himself had won. He was in big demand too, with celebrities and even with royalty who were keen to have their photo taken with him. In 1934 he starred in a film called Wild Boy produced by Gainsborough Pictures along with stars of the day, Sonnie Hale, Bud Flanagan and Chesney Allen. When his puppy-making days were at an end he went to live once again with his old trainer Sidney Orton at Burhill Kennels in Hersham in Surrey. On the 5th of May 1939 Mick passed away, in the same kennel at Burhill that he lived in while he raced. Arundel H Kempton eventually accepted a offer to have Mick stuffed and displayed at the British Natural History Museum in South Kensington in London. Mick went on display in July 1939. He was on display there until 1995. He was then moved to The British Natural Museum at Tring.